Stardom, a brand from Raidon Technology, Inc., announces Thunderbolt3 RAID storage - ST8-TB3, comes with dual Thunderbolt3 (Type-C) interface and can support both hardware RAID and software RAID. 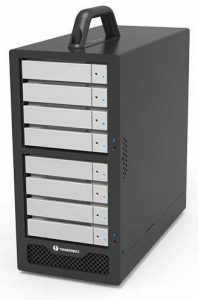 The ST8-TB3 RAID storage supports eight 3.5" or 2.5" HDDs or SSDs and comes with dual Thunderbolt3 (Type-C) interface, the data transfer rate up to 40Gb/s, it will be four times faster than USB3.1 Gen2 (10Gb/s) and eight times faster than USB 3.0 (5Gb/s). With one MiniDisplay port, user can connect second monitor to it for monitor extension. By support daisy chain function, user can connect up to six Thunderbolt devices through one Thunderbolt cable, it is to expansion the storage. 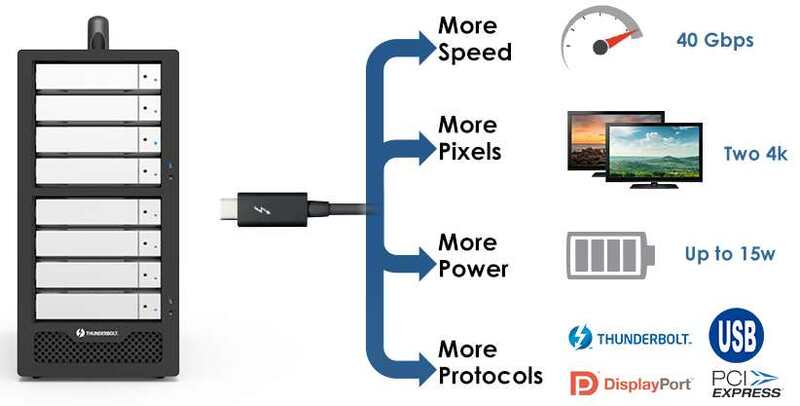 Each Thunderbolt3 port supports USB Power Delivery and provides up to 15W (5V/3A) to recharge the laptop or even the smart phone when using ST8-TB3. It also comes with the firm's standard aluminum handle for user to move the storage easier. Embedded one hardware RAID chip inside, ST8-TB3 provides RAID-0, 1, 10 and JBOD function. With GUI, user can set the RAID level depending on the application. If using JBOD mode, it means that PC/Mac will recognize ST8-TB3 as four independent drives, user can set software RAID groups by the OS such like Windows or macOS, or by the software provides by the 3rd party. The aluminum chassis provides heat dissipation, ensuring the drives or ST8-TB3 itself will not be damaged due to high temperature. 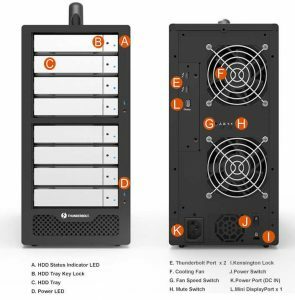 And the GUI provides email notification function, once the drive or ST8-TB3 has failure situation, not only the drive failure LED will lights on and ST8-TB3 will send one email to user automatically. Thunderbolt3 Port x 2( up to 40Gb/s ), Support 15W (5V/3A) Power Delivering.